Lil' Bits "Petals & Parasols" will furnish you with so many premade, finished digital elements that you won't know which one to choose!! Labels, journal cards and sentiments that are already so richly embellished that you can simply place them into your scrapbook layouts, cards and mini albums and achieve such stunning results that you can then focus on other design elements. 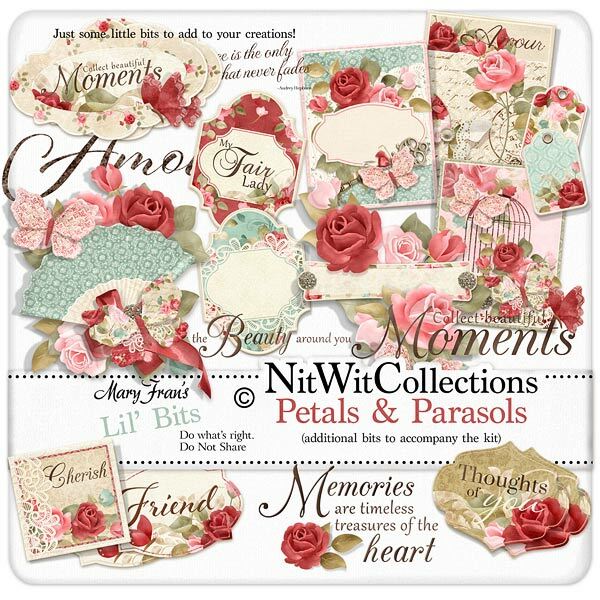 Don't miss out on these digital elements as they are not included in the FQB "Petals & Parasols" Collection so please don't miss out on owning and creating with these elements! 1 Journal Card in pink with a floral scene that contains a birdcage stamp and butterflies...simple beauty! 1 Journal Card in teal with a blank sentiment area in the centre. It is complete enough to be a card front! 1 Label - "Friend" wouldn't this be a great digital kit to design something for your best friend?? 1 Label with a floral display in the lower portion, but with lots of blank space for your name, date, title, etc. You decide! 1 Label - "Collect Beautiful Moments"
1 Label - "Thoughts of You"...for an anniversary, wedding or Valentine's themed creation perhaps?? 1 Rose cluster with a blank word tag set into it. Say what you mean, and mean what you say! 1 Sentiment - "Elegance is the only Beauty...."
1 Sentiment - "Collect Beautiful Moments"
1 Sentiment - "Memories are timeless..."
1 Sentiment - "Delight in the Beauty Around You"